Today I should have been traveling down to Sussex for a post operation eye check up. These journeys need careful planning, as it is quite some journey there and back. For example I had to book the minibus to get me to the station last Wednesday, and the taxi back from Saxmundham tonight was booked 3 weeks ago. On top of that, as any sensible traveller does, likely delays have to be accounted for, so I always look to get through London at least an hour earlier than I actually need too. Normally it goes very well. However the one link I can't make any allowance for is getting from Halesworth to Ipswich. .There is a train at 0759. The next one is 0941 so you will understand if the 0759 is affected so does the whole day. Today there was a points failure at Norwich, meaning some units were delayed in starting their day. Unfortunately the unit forming the 0727 Lowestoft - Ipswich was one of them. Now that is NOT the fault of Greater Anglia. Infrastructure faults are down to Network Rail and I am not blaming GA for a second that the train had to be cancelled. I got to Halesworth Station to see that a replacement bus was operating. Not a problem as my buffer zone would come into play and as long as I was at Ipswich in time for the 1008 I would still make my appointment. So the ten or so of us waited for the bus to arrive. And waited. I tweeted GA who helpfully informed me what time the bus should have left Lowestoft, but couldn't tell me if it actually had or if it was ever going to arrive at Halesworth. Other passengers suffered a similar lack of information from other sources. At one point someone was told the bus was 10 mins away. 40 mins later at 0917, some 78 mins after the train was due a Panther Travel coach arrived with one, yes one passenger on board who alighted at Halesworth. Where the passengers from Lowestoft and Beccles were is anyone's guess. The driver to put it politely was clueless. He had no idea where he was meant to be going, if he had to call at other stations, and was actually advising people to wait for the next train. By this time I knew I had no chance of making the 1008 and using my inside knowledge plan B was brought out. In my time as a Conductor I called many a taxi for a delayed customer in a variety of circumstances. The threshold for this was an hour's delay or more. So I called GA's Customer Service team to request a taxi as my delay had exceeded that hour. To my astonishment the lady on the other end of the phone said as they couldn't verify the bus was that late she couldn't do anything. I beg your pardon? Isn't that basically accusing me of lying? What about the numerous tweets and phonecalls by others? Is there no communication whatsoever between departments? So I spoke to a supervisor who said even if the bus was that late because alternative transport had been provided she couldn't authorise a taxi, which she couldn't anyway as only the control team could do that. So that was that. Cancel appointment, and taxi tonight, and re-book for next week. A day of my life I'll never get back. it will get you there quicker than waiting for the next train. Now the important words there are "final destination". GA had provided alternative transport to Ipswich, however it would still have got me there too late to get my connecting train. My original connection should have been the 0908 from Ipswich, but the earliest connection I would have caught would have been the 1043, well over the 60 min threshold. Needless to say a taxi would have got me to East Grinstead quicker than the train too. Therefore by GA's own criteria I was entitled to alternative transport to my FINAL destination. The Twitter team told me to claim a refund, but since I never got the chance to buy the ticket in the first place as the East Suffolk Line is unmanned that was a waste of breath too! So not a good day, either for myself or for Greater Anglia, who in the past I have defended to the hilt in the face of unfair criticism. However this criticism is more than justified and really GA's staff should know their own rules. Again there really hasn't been too much going on this week to warrant a full round up, but in the last 24 hours a few things have taken my notice which deserve to me mentiioned. First of all I am very grateful to regular correspondent David Green, who keeps me updated on all things Galloway. David got in touch yesterday to tell me that Galloway have won the tender to operate the 113/4 Ipswich - Diss service from Simmonds. This will please God finally mean the end of those appalingly ghastly Plaxton Primos that Simmonds have been using on the route. David didn't tell me from what date Galloway are taking over but I would presume September. It will be interesting to find out what vehicles Galloway intend using on the route, and if they will be new or not. Galloway have also secured another Stowmarket - Bury route (service number unknown) to complement their existing routes. I was going to post a pic of one of Simmonds Primos, but due to a memory card crash I can't access my pic archive at present, so did a Flickr search and found something far more scary! 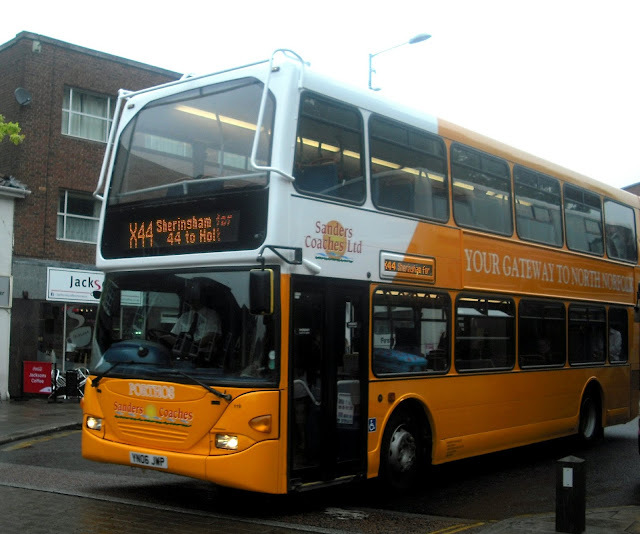 Does this livery from Baker Bus look familiar? I will never criticise a hard seated Anglian Scania again as Lord above it could be so much worse! This pic is by daveshrimpton60 whose Flickr page you can access here. Movng very swiftly on, literally in this case, and what is inevitibly to become the world's most famous preserved AEC Swift is as I type on its way back to Yarmouth after a spell of TLC at Rotherham. I felt sorry for Grahame Bessey yesterday when he was delayed for hours at Cambridge because of rail probs, but no longer. The jammy sod is on board said Swift and posted this pic on Twitter just prior to departure from Rotherham. 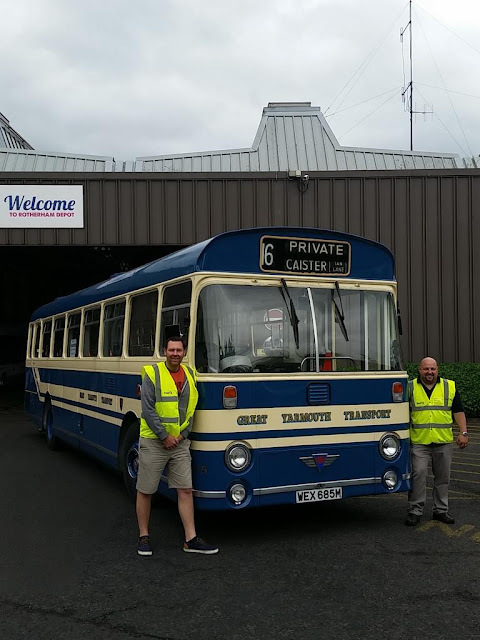 The Swift is pictured with owners Danny Beales, Depot Manager at First Great Yarmouth, and a professional photo bomber. 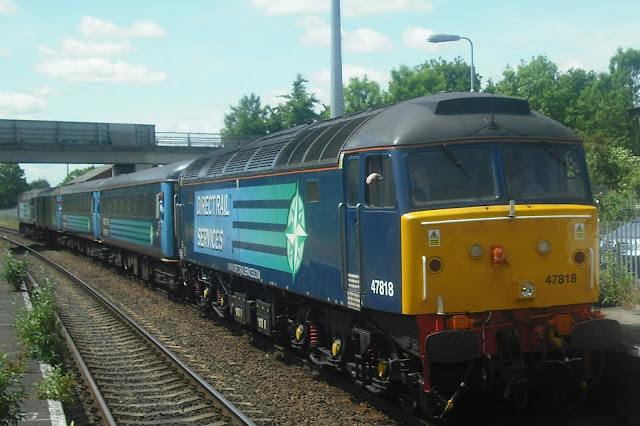 In other news (there isn't much) two more repaints have hit the streets of Norwich - the second Gemini 2 to be painted into Urban livery, 36172, is back on the road as is former Yarmouth Dart 42921, which was painted in house and Roundtree Way depot. This has apparently created some lively debate as it doesn't match to the millimetre other examples found around the country. I have yet to see it in the flesh so cannot comment, but it is a 10 year old Dart. It could have been painted by the ghost of Andy Warhol and it would still be a polished turd. Must be better things to talk about and if you are going to start painting in house (good economics) you need to practice on vehicles that don't matter if it turns out a little different. 42921 doesn't matter. Enough said. Also in Norwich on loan Rotherham President 33126 has gained new style Norwich vinyls. Many thanks to Cameron Robinson for taking the trouble to send the pic in. That's just about it. I have a busy week this week away from buses, plus it's Wimbledon so doubt I'll be out much but I'll post what I can when I can. Expect another Scottish post, hopefully one from London if my check up goes smoothly, and a post from Brighton Station I've had in the wings for weeks! Enjoy the sun! In my previous post I reported on my trip around the Isle of Harris while on a very short break to the Outer Hebrides. Today I will concentrate on the Isle of Lewis and its Capital, Stornoway. Stornoway has a popuation of around 6,000 - the same as Halesworth and less then Cromer or Sherngham. Yet the bus network is simply amazing. 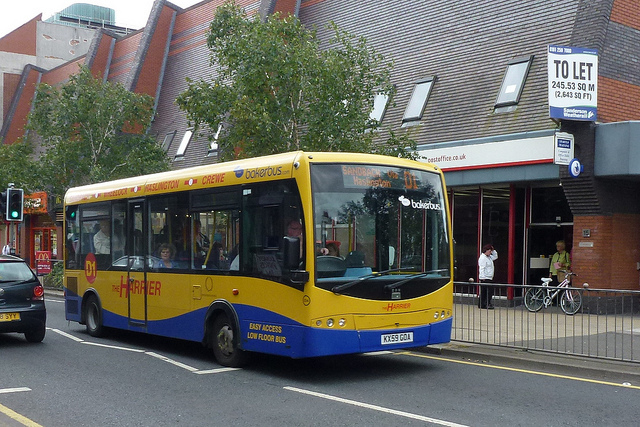 To put it into perspective Halesworth has around 50 bus journeys a day either arriving or leaving the town. Stornoway has 250 ALL of which are sponsored by the Western Isles Council. The Isle of Eriskay has a population of 173 and has up to 10 buses a day. I live in a village of 550 and have 4 buses a week. And yes the Islands have dial-a-ride style community transport too. 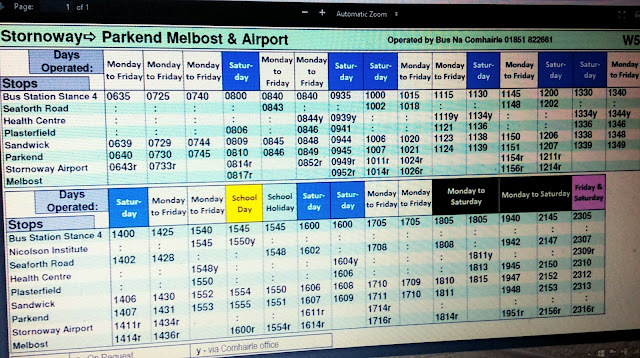 Here is pic of the timetable for the route I used to and from my guesthouse in Melbost. You may have to click on it and enlarge to read it properly but it demonstrates the frequencies out there. Note the late journeys on Friday and Saturday nights. All routes have them. Incidentally that is ony a summary timetable - the actual route is much longer. So what is used on the island to carry people around? 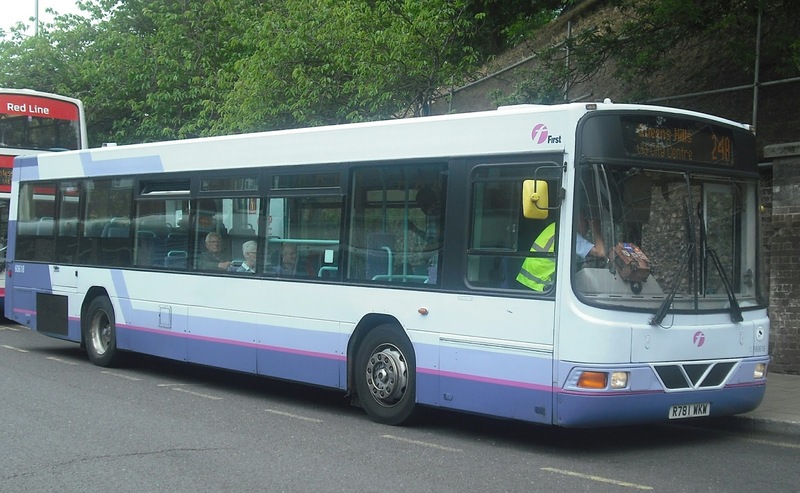 Well the W5 is operated by a fleet of 5 34 seater Optare Solo SR's, owned by the Council. There are few other proper buses on the Island. There is one E200, which will have its own post in due course, and apart from a couple of unidentifiied school buses only one other bus - this Plaxton Centro bodied VDL SB200, also owned by the Council. All other services are operated by coach, and one coach in particular caught my eye on the servce to Uig. This Irizar bodied Scania K114 was new to Allan of Gorebridge as B17 DWA. It was given its current regstration before being sold to Graham Urquart Travel in Inverness, Gibson Direct of Renfrew then operated it as G13BSO before it was sold to MacLennan of Stornoway. Thanks to busmanscotland on Flickr for the info. Finally a couple of pics of the Bus Station and of the harbour from the Bus Station. In the second picture the recently withdrawn Caledonian Macbrayne ferry Isle of Lewis can be seen in the background. Recntly replaced by a newer ferry this vessel is kept in operating condition and shortly after I took the pic it set sail. Note the highly unusual weather for Stornoway! That's just about it. There will be another post on the most Northwesterly E200 in the UK, but if this has whetted any appetites and some of you now want to visit these magical islands yourself then the timetable website can be accessed here. It really shows what can be done when a Council gets its public transport policy prioritised. It has taken a long time for me to get round to this but back in May I went up to the Outer Hebrides for a couple of days, staying in a quite delightful guest house in Stornoway. Now obviously going up there you are playing roulette with the weather, but the one full day I was there was sunny and fairly warm so the gamble paid off. Although I was staying on Lewis the dramatic scenery is in Harris, and as the islands have a bus service that is the envy of rural Suffolk I worked out I could travel around the Isle of Harris going down to the ferry port of Leverburgh via the west coast one way, and returnng by the quite remarkable east coast the other. A little bit about the bus services out there. They are all sponsored by the local council, and run from 6am till gone 11pm on Friday nights. They are extremely frequent taking into account the remoteness of the area. There are no Sunday buses, but shops don't open either - not even Tesco. There are very few proper buses on the islands - no double deckers for obvious reasons as winds can get extremely high. There are 4 14 reg Optare Solos, an E200, of which more in another post and a school bus. 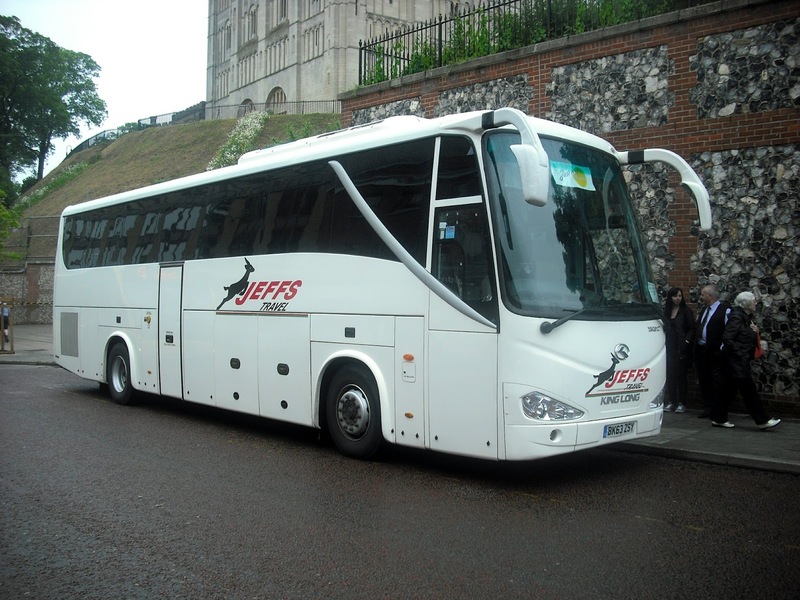 Everything else is either operated by coaches or small minibuses. 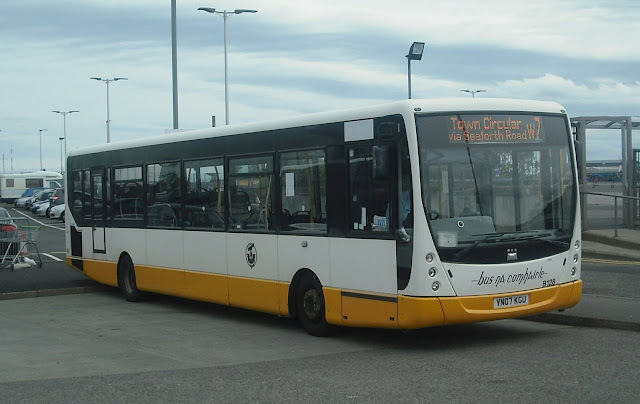 After getting into Stornoway on one of the Solos (more in a future post) my first vehicle on the long journey down to Leverburgh was Volvo B10M Paragon T599 BRG operated by Hebridean Transport based in Tarbot on Harris. New to Snaith of Otterburn near Newcastle I was pleasantly surprised by the quality this coach was still in, and it gave a ride nearly as good as the views. Taken out of the window. A tad more dramatic than Gorleston High St.
At the halfway point of Tarbot there was a surprise. We were told to get off the coach and get on a rather smaller Transit minibus. I assumed this was due to the mountainous terrain, but no - politics rears its ugly head and the (same) driver revealed the council only paid for a 14 seater on that part of the route so that's all it got. 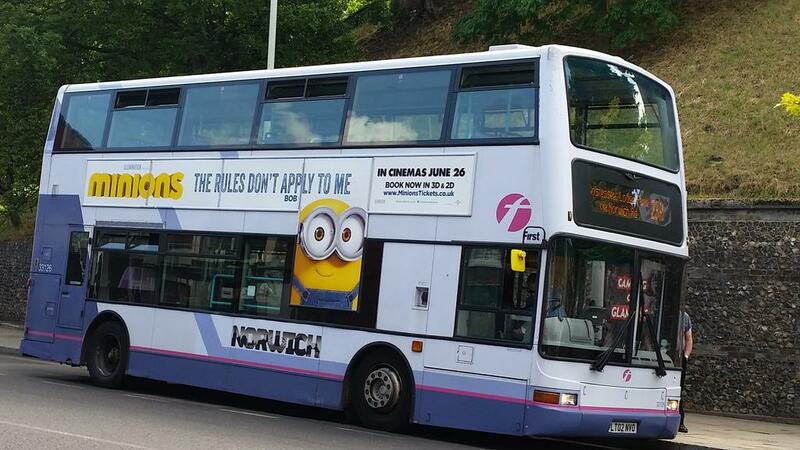 When I enquired what happened if more than 14 people wanted the bus the simple reply was "they get left behind". Ooookay! Luckily there were only 10 of us so we all got on! After more spectaular scenery we arrived at the bustling (slight exaggeration) ferry port of Leverburgh. That's what the council pay for so that's what you get! As if to rub salt in the booted off the coach wound as we arrived at Leverburgh I saw this rather smart coach waiting to board the ferry. SP64 LYN is a Van Hool TX15 Alicron belonging to Aberfeldy Motor Services of Perth. After a stroll around it was time to get on another Transit minibus around the lunar like landscape of the east coast back to Tarbot. Space Odyssey was filmed there and you can eaily see why. That is when you're not holding on for dear life as this route is the closest you will come in the UK to a bus rollercoaster. Simply exhilarating and I am going to have to return to that route to take pics of some of the remotest bus shelters you wil ever find. Next time I'm getting rained on at Wangford which has no shelter I'll think of them. What a route. Anyway thanks to the efforts of my rally driver we got back to Tarbot in time for the connection back to Stornoway - the same coach that brought me out. It is a journey I will definitely repeat. There really isn't enough material for a major round up, but this is what has been occuring, including some news yet to be published elsewhere. 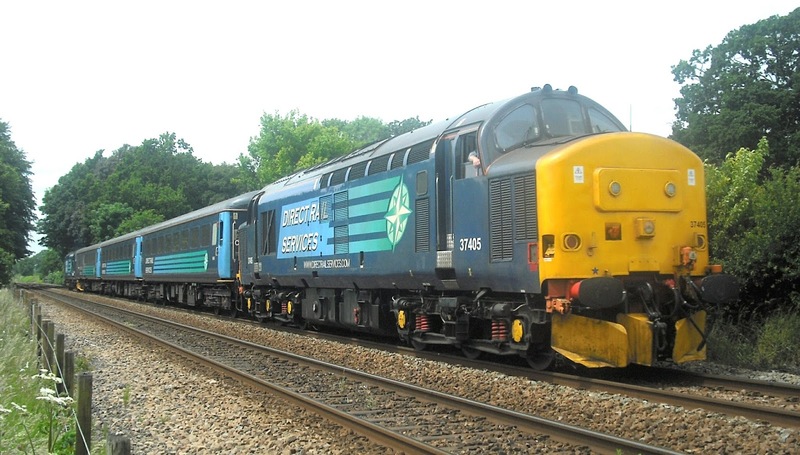 Obviously the Short Set has been grabbing all the attention this week, with the Class 37's making a spectacular entrance. That maybe a recurrng theme throughout the Summer. I make no apology for publishing this pic again as it's up there with the best I've ever taken! However there has been some bus news too. First of all an Olympian update from Yarmouth, and both 34109 and 34186 are currently off the road needing new gearboxes. The search is on for replacement gearboxes but finding parts with warranties is proving difficult, and at the moment there are no spare Ollies in the First fleet. As and when I get any further news I will of course pass it on, but I understand at the moment the intention is to get them both back on the road in time. Elsewhere in Yarmouth ex Leicester Gemini 32629 is back on the road after an engine transplant, and former Yarmouth Dart 42921, now at Norwich is being repainted into Urban livery and should be back out this week. 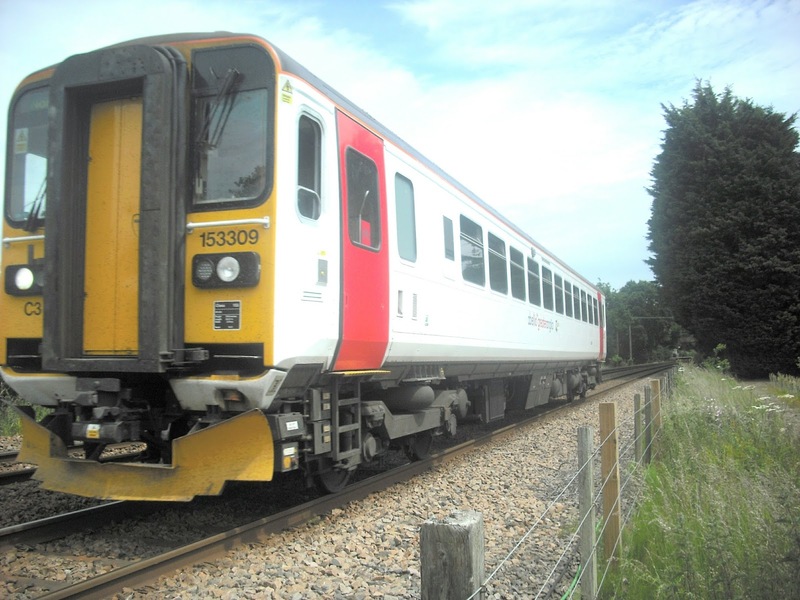 In Ipswich the 53 is being reduced to every 15 mins, which will reduce the PVR by one, thus releasing another vehicle to be transfered elsewhere. Which vehicle and type is still undecided and again as soon as I hear anything else I'll publish it. The most interesting news of the week has come from Konect. The 20 new vehicles have been confirmed as bog standard AD E400's, not MMC's sadly. These buses will be used on Park & Ride and the 8. Interestingly the 8 is going to receive a new Express livery so that will be worth waiting for. 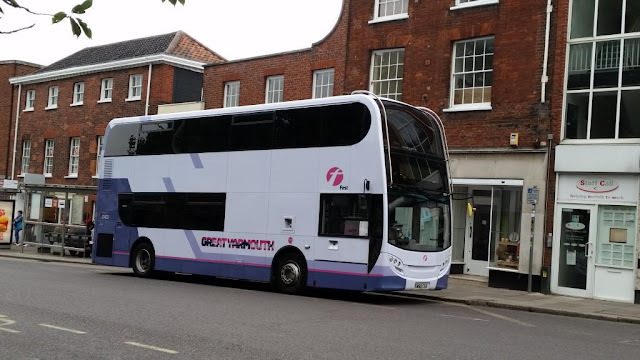 The current E400's on the 8 will be rebranded for the 2 with the current P&R E400's replacing the Geminis in the current fleet which look likely to move to Hedingham to replace the Olympians. September is going to be an interesting month at Konect. My thanks to my contact at Konect for the information. Nothing else of great note springs to mind except the revamped Kings Lynn Bus Station is nearing completion. I admit I have been avoiding it while it has been rebuilt, but I'll be catching up with all things Stagecoach Norfolk and Lynx once the Bus Station is open again. I must thank Cameron for writing yesterday's post, and if anyone else wants to write posts feel free to contact me and you can join the team! Have a good week. PS here's a trivia question for you - answer next week unless someone gets the answer before - when Maida Vale Underground Station opened in 1915 what was unique about it? I'm starting to have withdrawal symptoms of not blogging anymore, so i have decided to do a guest post on my day out today. Thanks to Steve for allowing me! Today i headed into the fine city of Norwich in order to spot 60618. Luckily, i succeeded and got a very good shot at Thorpe. After that, i headed back into the city to try and find newly painted 36180. Newly painted 36180 at the Rail Station showing Martham 1. After a lovely ride on 36180 back into the city, i came across a very clean KonectBus. KonectBus 400 looking very smart, as if it's just came out of the paintshop! A rare sighting! 33815 laying over on St Stephens St.
Last up is newly painted Stagecoach Norfolk Optare Tempo into Stagecoaches 'beachball' livery. And surprisingly, it does look incredibly smart! Newly painted Stagecoach Norfolk 25126 YJ57EHX working the X29 on Castle Meadow. Sorry - just couldn't resist this headline as it is becoming apparent that First's special offer on the 99 between Kessingland and Lowestoft of a flat fare of £1 is beginning to pay dividends. I have noticed in recent days people letting Anglian 61's go, preferring to wait for the 99, and both Anglian drivers and sources at First have confirmed this. Apparently the 99 is taking more revenue than ever and so the £1 fare looks set to stay. 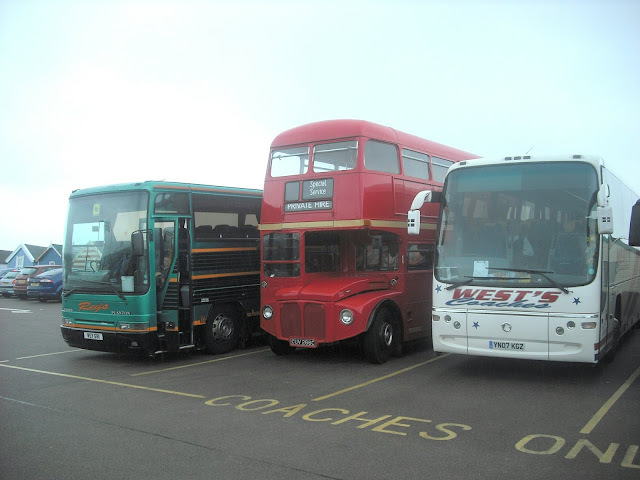 Incidentally you might like to know that on a Saturday there are no less than 85 buses from Kessingland to Lowestoft. That is more than there is from Yarmouth to Norwich and doesn't include the 146. A slight overkill? So onto today's sightings and I only had around half hour in Norwich but a very productive one it was. 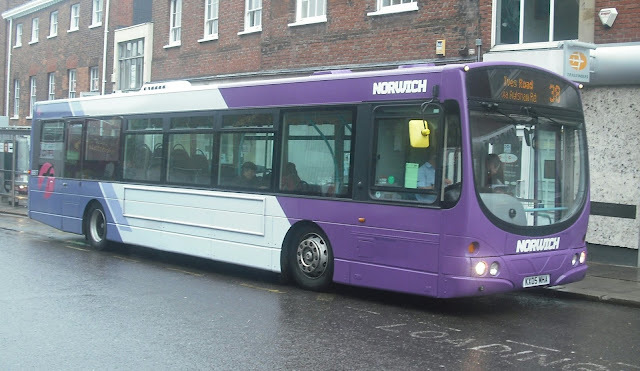 The main target was the nomadic Rotherham Volvo B10B 60618 which has moved to Norwich to cover the repaints there. Today it was on the Red Line operating 24A's. 60618 wasn't the only Wright Renown Volvo cruising around the City today, as right on its heels came former Ipswich and Yarmouth 60808 now a Norwich Training Bus. It was a day for sightings of a difference, and next up is Yarmouth Routemaster RML 1623 which was on wedding duties in Norwich today. What is it about these buses that always brings a smile to the face. Can't say that about Presidents! There must be something about the number 23, as next we have First's other eye catching bus ending in 23 - yes that bus 33423 which was on Private Hire duties in Norfolk today. Cameron Robinson caught her taking a breather in Castle Meadow and sent me this pic. Thanks buddy! Finally the first pic I have taken of Sanders' newest single decker, 227, ex Mancherster Airport VDL YJ10 DJV. It was operating on the X44's today and I snapped it in Casttle Meadow to cap a very good half hour. In case anyone thought I was exaggerating a little in my lyrical waxing over the Class 37's on the short set yesterday, the entirely useful Tim Miller was at Haddiscoe Station today to get a video of these animals in action. I heard them leave Lowestoft, Tim, and even from a bus it was spine tingling! Great video buddy. After the farewell to the Class 47's on the short set on Monday, today saw the first day in service of the Class 37's. Not any newer but without doubt the playground bullies of the loco world. The 47's make you stop and stare but the 37's have you doffing your cap and calling them 'sir'! Their first journey was the 0747 from Lowestoft to Norwich and I'm very grateful to Grahame Bessey who was there to capture the moment. I had decided to go somewhere a bit different to get my pics and so ended up at the wonderfully picturesque and peaceful Brundall Gardens Station for a couple of hours. Brundall Gardens Station was originally built in the 1920's at the request of a wealthy landowner who had created the Brundall Gardens which had become a very popular tourist attraction. The Gardens have long gone but the peaceful station remains, and is accessed by an unmade road. There is also a path running parallel to the Norwich bound track, which if followed brings you out in a field with a great view of the line. I decided this would be the spot to photo the short set on its way to Yarmouth. The test pic of a class 153 didn't turn out too bad! 2 mins later and I heard the rumble of something big approaching. There are no words to describe just what a sight this was, and sound too. We have waited a long time for the 37's and boy has it been worth it. 37405 heads the short set heading for Yarmouth. Just wow. I had to wait nearly an hour for it to return and in that time my camera decided to misbehave. The idea was to take the pics from the footbridge at Brundall Gardens and indeed my distant shot didn't come out bad, catching 37425 approaching the station. However my close up shot failed miserably so I had to settle for a shot from the platform of 37425. One thing to note is that with the 47's the trailing loco was just idling all journey and the front loco did all the work. Not so wiith the 37's. Both loco's share the work and so the sound is in glorious stereo and what a sound it is. Spine tingling. I have a feeling it's going to be a regular jaunt during the Summer, finding as many different locations to photo these magnificent beasts. 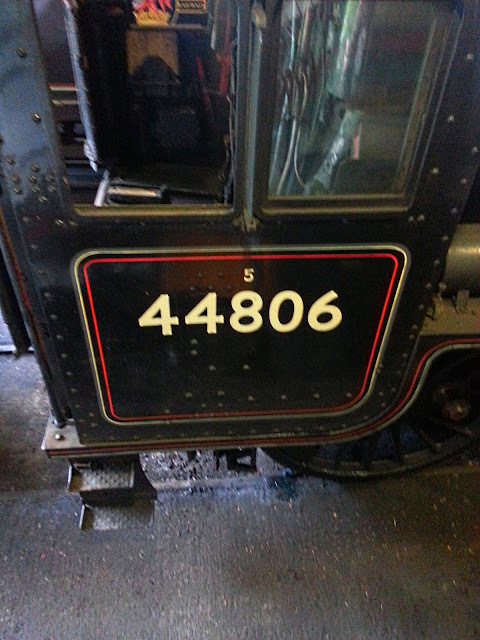 Now I have a question for those of you more knowledgable of the local rolling stock than I am. 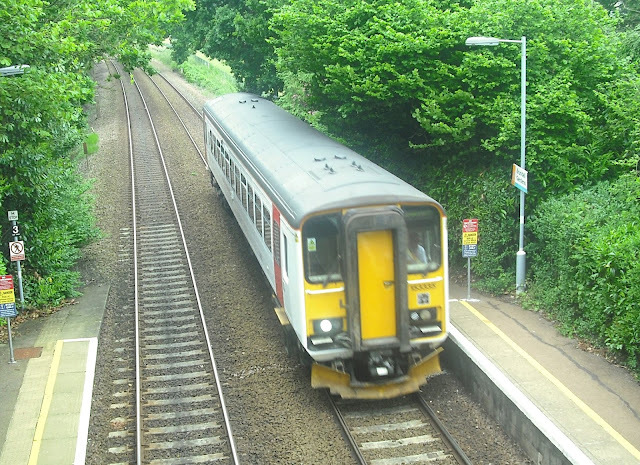 The very first train I photo'd today was one of the 3 Class 153's on the Yarmouth/Lowestoft routes today and I noticed something for the first time. Can someone please tell me why they have two different looking ends. I assume it relates to their former two car lives, but which end is the original! If you compare this pic of 153335 with the pic of 153309 above you'll see what I mean. Finally tonight I had time on return to Norwich to grab my first pics of freshly pained Gemini2 36180. I have to say that after the majesty of the 37's I was left feeling rather underwhelmed! Here is Part Two of Quintin Plane's guest post on his trip to the Yorkshire Moors Railway. If you missed Part One you can see it here. 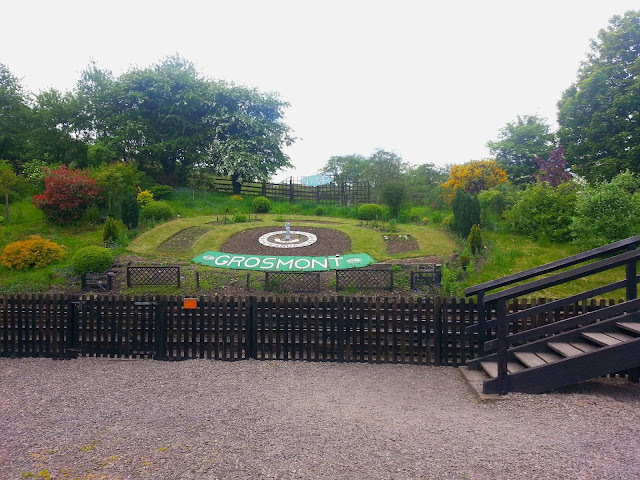 In this part, my discovery focused around Grosmont and the surrounding area. Home to a rail station restored and preserved in the 1960s style, much of the village shares that ‘60s style, including the oldest independent Co-operative society. 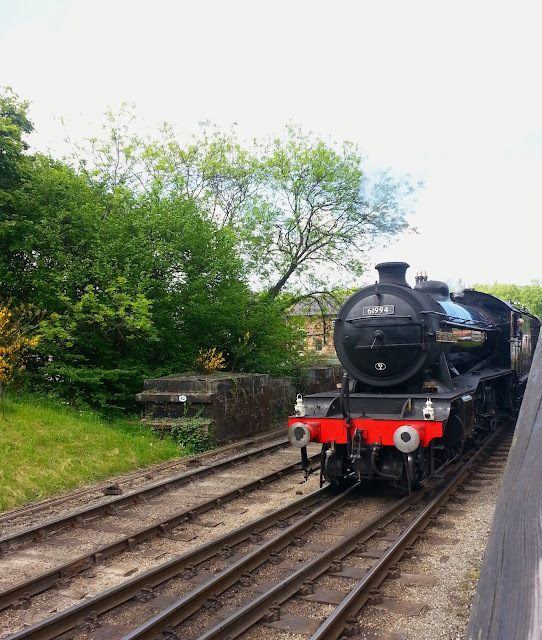 Grosmont also houses the majority of the locomotives owned and run by NYMR. To access the engine sheds, visitors must head south alongside the tracks through a 250 yard tunnel. However, just before reaching that, there was the perfect opportunity to get a wonderful photo of the train hauled by LNER Class K4 2-6-0 steam loco I had just vacated. The engine sheds lie in a secluded spot at the end of the tunnel. 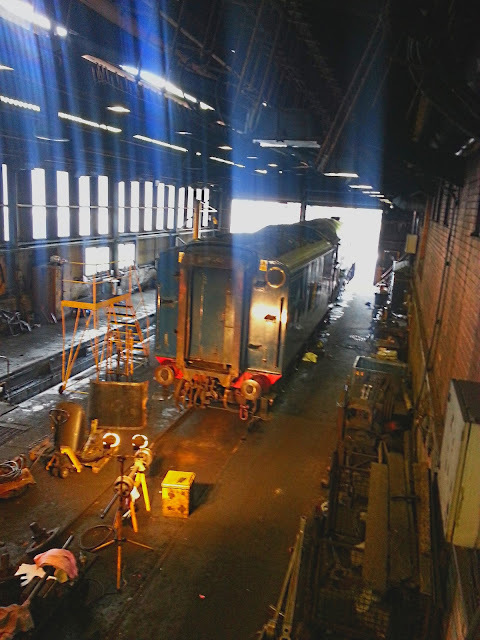 With time a limiting factor, there was only time for a quick look at the locos in the sheds on that day. 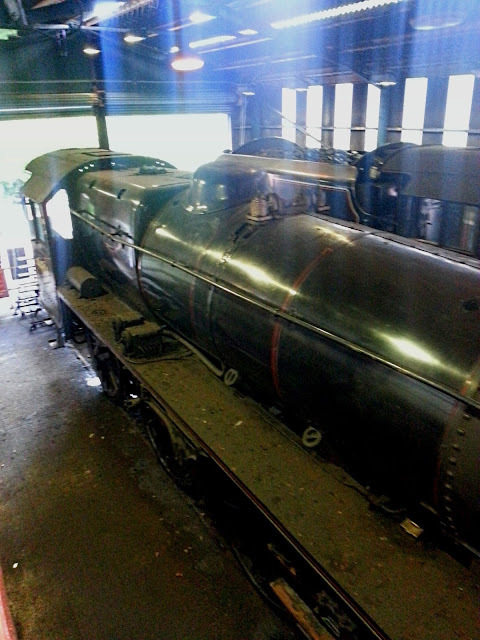 First up, a LMS 5MT ‘Black 5′ 4-6-0 stood proudly at the entrance of the sheds. Also present on that side of the sheds was Sir Nigel Gresley, a LNER A4 4-6-2 (60007). Some may recognise that its sister, 60022 Mallard, is the world speed record for a steam-hauled train. However, 60007 has a record of its own. It holds the record for the fastest steam passenger service (Mallard’s record was a special attempt). 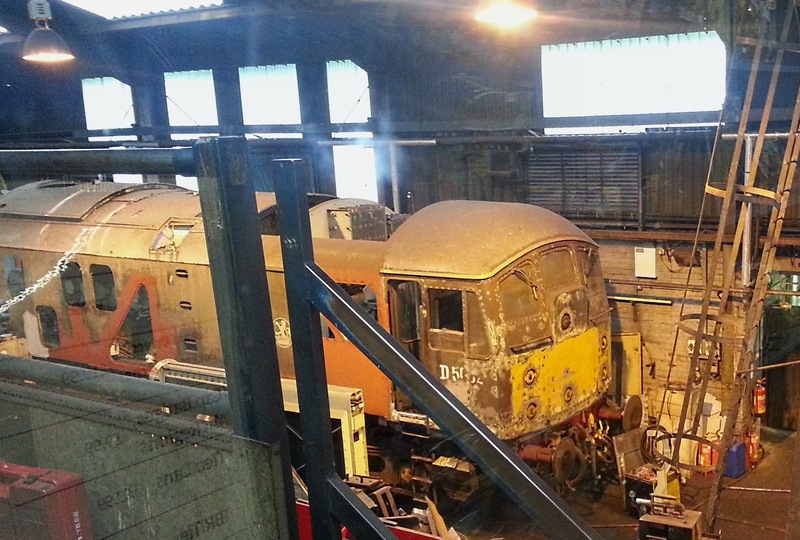 On the other side of the shed (split up by the NYMR model shop, lies the restoration section. Currently undergoing restoration is D5032, a BR Class 24 given the name Helen Turner. Built at Crewe in 1959, the locomotive saw most of its working life in the London Midland Region until its withdrawal in 1976. With the day drawing to a close and the clouds closing, there was time for just one more surprise. 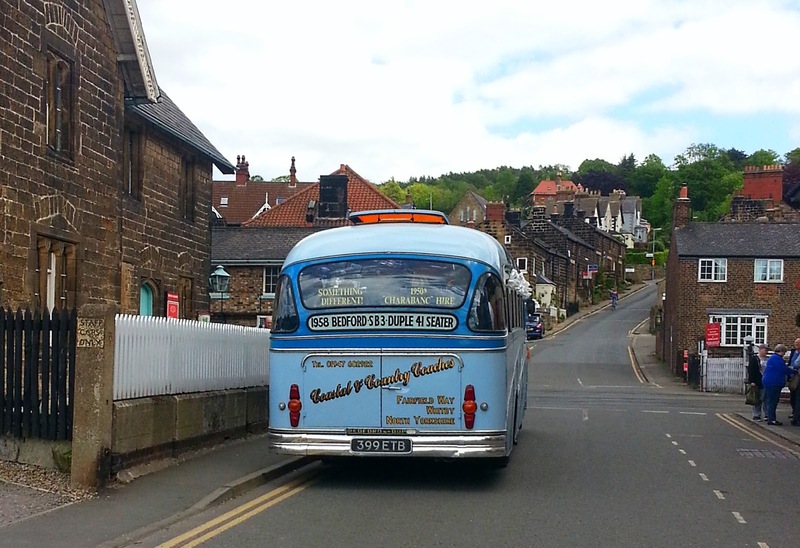 Those remembering back to part 1 will remember the Bedford SB5 in Whitby. Well to my surprise, I thought it had suddenly turned up in Grosmont (considering both were dressed with white bows along the windows, it’s an easy mistake). Only later did I realise it was in fact a second preserved bus from Coastal and Country Coaches in Whitby. This time it was a 1958 Bedford SB3 (smaller engine) with Duple Vega bodywork. What a way to finish off the day and finish this series with. Today was meant to be the last full day of the Class 47's operating the Short Set. They are scheduled to operate a couple of early services Tuesday morning, then the giant 37's will take over with a couple of test trips tomorrow, then in service on Wednesday. Of course all things are subject to last minute change again but that is the current plan. So with the sun remembering it's June and popping to East Anglia for a visit I travelled to Acle Station to get some last photos of these old warhorses. First up was the Yarmouth bound 1256 from Acle with my personal favourite "Emily" 47818 leading. 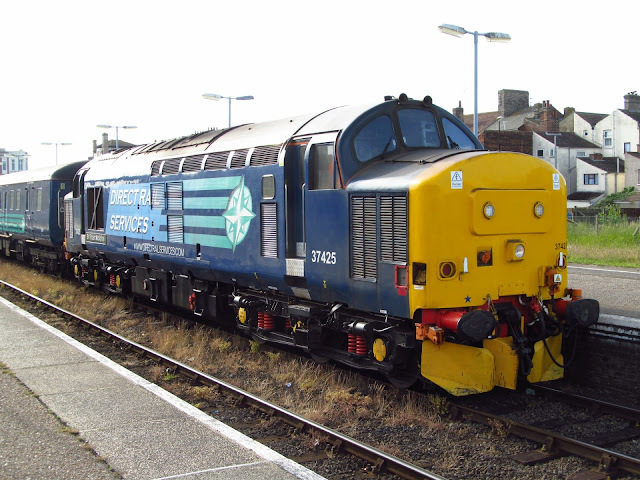 The pics of this service were taken from the Norwich bound platform. The set pulls away with Emily smoking well! I then moved away from the station onto the road bridge to capture the return trip, and was rewarded with some really good shots. And so it's farewell to the 47's - probably. Thanks for the memories and the photos, and bring on the beasts! A Summer Saturday in June, so of course it was dark, miserable and wet all day. Not a good day for taking photos but take some I did during my day, including a vehicle on its first day out. Not freshly painted 36180 as hoped, but Sanders latest acquisition from Reading Buses, Scania Omnideka YN06 JWP which thanks to an eagle eyed Cameron I managed to snap in Castle Meadow. Also at Castle Meadow was ex Ipswich Volvo B7rle 66977 in her new purple guise. I'd already seen her but this was the first photo opportunity I'd had. If you read Friday's post you will have seen that amazingly well preserved 1947 Bedford OB at Southwold. It was not as sunny in Southwold yesterday but another varied mix of vehicles was in evidence - you would not believe how many people were at Southwold in the pouring rain yesterday! Incuded in the line up was a Routemaster - what is it about those machines that raises the spirits whenever you see one? Closer inspection showed it to be Carters Coaches Routemaster RML 1266, and it lit up a very miserable day! Jay and Kay's VDL JK15 JNK at Southwold. 4 weeks ago I was down in Kent taking pics of two pretty unique vehicles, an Irisbus Agoraline, and the only King Long bus in the country. So already yesterday I had seen an Irisbus coach, and in Norwich I did quite a double take to see a Chinese King Long coach in Castle Meadow. I have no idea how many King Long coaches there are in the country - perhaps someone can enlighten me on that one. This one is owned by Jeff's Travel of Brackley in Northamptonshire. Trains take the spotlight this week, with the short set finall being taken over by Class 37 locos. Tomorrow (monday) is the planned last day of the 47's, and I'm hoping to get pics of them on their last day, then on Wednesday to get pics of the 37's. That is of course if they are out as it should be remembered the short set is a reserve train and only used if there is a shortage of DMU's.